Case performed by Dr. Feriduni – 4374 FU in 2 procedures FUE performed on a 47-year old Caucasian male with • NW III vertex,Clas T • Donor density of 80 FU/cm? • Hair diameter of ~58-62 microns Treatment plan • 1st Follicular Unit Extraction Transplantation to restore the crown area. • 2nd Follicular Unit Extraction Transplantation to attain an aesthetic reconstruction of the hairline and add more density. Performed procedures 1st procedure (November 11th, 2015) Follicular Unit Extraction Transplantation with 2354 FU * 300 single hair FU * 850 double hair FU * 1204 triple hair FU Parallel incisions in custom-sized blades technique (Cutting Edge blades of 0.8-0.9mm). Extraction performed with a 0.8mm FUE punch with CIT Manual Punch Handle. No microscopic preparation of the follicular unit grafts. 2nd procedure (June 6th, 2016) Follicular Unit Extraction Transplantation with 2020 FU * 479 single hair FU * 400 double hair FU * 1141 triple hair FU Parallel incisions in custom-sized blades technique (Cutting Edge blades of 0.8-0.9 mm). Extraction performed with a 0.8mm FUE punch with CIT Manual Punch Handle. No microscopic preparation of the follicular unit grafts. Case performed by Dr. Feriduni – 2171 FU in 1 procedure FUT performed on 57-year old Caucasian female with • Type Ludwig I • Donor density of 80 FU/cm? • Hair diameter of ~64-72 microns Treatment plan • Follicular Unit Strip to add more density to the hairline and restore the midhead section. Performed procedure (August 13th, 2012) Follicular Unit Strip Transplantation with 2171 FU * 478 single hair FU * 1293 double hair FU * 400 triple hair FU Parallel incisions in custom-sized blades technique (~Cutting Edge blades of 0.7-0.9 mm). FUE vs SMP for sparse areas. I just had a FUE HT two weeks ago. The hair greed is already manifesting itself. I'm not sure I'd be ready to go through another operation soon. A HT in a thinning area is quite a gamble and I like the idea to just drive to Milan for 5 hours and leave the next day with my results and no post-op restrictions. I've seen some amazing SMP's into the crown for guys with longer hair here. No shedding, no shockloss, it almost sounds too good to be true. It would enable me to ditch the concealers. It seems to me that HT's are mandatory to rebuild the hairline and create a bit of volume at the front, but if your hairloss is moderate at the back, a SMP is a better pick. What do you guys reckon? What norwood am I? How many grafts do I need? I have a couple questions, but first here's my status: I turn 41 in two weeks, take fin daily (and have for 15 years) and have never had a hair transplant, so I "think" it's safe for me to pursue a dense frontal 1/3rd hairline and "behind the forelock" HT procedure. My questions: 1. Can I choose either FUT or FUE with this amount of hair, and with this being my first HT (see pics)? 2. I can't decide if I'm a norwood 2 or 3 -- any help from you guys would be great 3. How many grafts would you say I need for a dense "Rahal type" hairline (50+ grafts / cm2)? Not saying I"m going with Rahal, but you get the gist of what I mean here. I've only had one consultation thus far, many more planned, but wanted to ask these questions above anyway -- Thanks in advance! FYI - scarring in back of head from car accident. Hair density- how to justify? Hi there. This is my first question on this forum, so forgive me if it's something old, but I've done my homework but still can't find a satisfactory answer to my concern. I've looked at before and after photos of many patients, and wonder how as patients we are sure that the doctors are implanting the agreed-upon amount of hair. Is that something that the patients have to take on faith? Let's say given the area and the amount of grafts, we come up with 60 grafts/ cm2, so should we expect to see 60 incisions (or at least close to that number)? I know that some of you will say many grafts are transplanted without a mark, so how are we to determine if that is the case? As far as I'm aware, no clinic agrees to tape the whole procedure (or have a friend of the patient tape the whole procedure) and hand it to the patient as a souvenir. Why not? Again, sorry if this post seems cynical. Just wondering if anyone feels the same way. Thanks for your time. This gentleman in his 30's came to Dr. Arocha with AGA. Dr. Arocha restored density in the frontal region and the hairline by performing a FUT of 4145 FU's. Below are the results from 2 years post surgery. 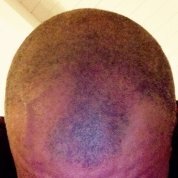 How do Docs determine number of donor hair available?